In the 26th Feb 2013 edition of BPTrends [Harmon 2013], Paul Harmon wrote about the role feedback and group activities play in business processes. In particular, he pointed out an easy to miss and difficult to model common snippet that needs to be handled when creating feedback or review tasks. Typically the feedback process looks something like figure 1. This however assumes more than the brief and is a notational hack to show what we want. On reading Paul’s article and remembering back to similar structures that I have mapped for large organizations, where reviews are conducted by other team members and simply reviewing work does not make one a manager. I then popped over to the Activiti forums and looked up the general approach that is used within the execution engine. It turns out that generally these exceptions can be easily dealt with using Task and Event listeners. 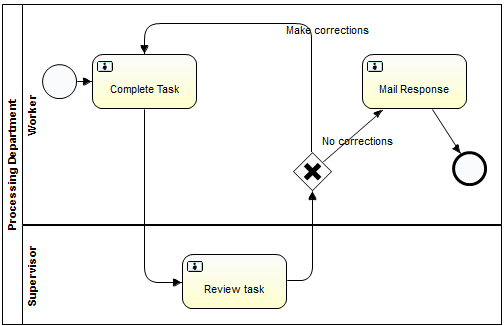 What this means is, that during the modelling phase, execution based listeners are placed on each task and are fired when a task or event is created, assigned and completed. Using this approach a range of very complex constraints can be encoded over a process design. In this article I will demonstrate the creation of a generic listener and constraints that could be implemented to ensure that feedback monitoring can be managed. Then I will describe the general way I would describe the constraints as part of an analyst project. 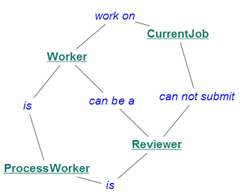 Semantic effect annotations offer a means to reason over business process models. By reasoning with process effects, we are able to capture the organizational operation model, i.e., “what does this process do?” This is important as it allows us to understand what happens as a result of a business process execution; and what execution scenarios a process designer has created for the organization. In other approaches that rely on syntactical process analysis, no information as to what processes do can be extracted from the process models. This makes pure syntactic analysis difficult when attempting to answer “what” questions about process models. By including a semi-structured description in the annotations on the model, we do not lose any of the intent of the process model and do not overload the BPMN structure with unclear syntactic hacks. Then, under the hood on the execution end, we can implement a listener structure that follows the constraints described in the annotations. 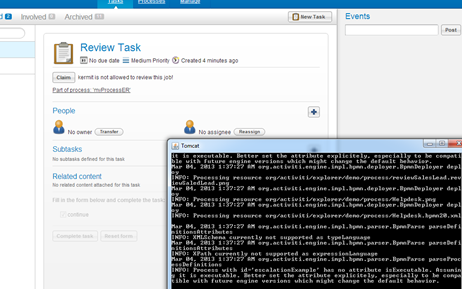 So to follow along at this point, we’ll generate a simple deployment of the process. For those of you who have a copy of Tijs Rademakers book ‘Activiti in Action’ [Rademakers 2012], you’ll most likely remember this code from Chapter 6. 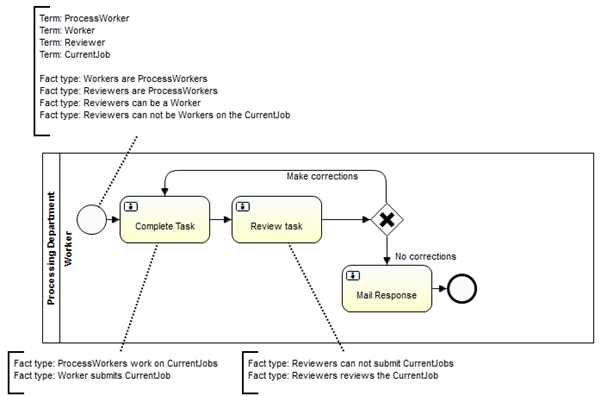 We’ll then associate the task listener class to the create, assignment, and completion events for each activity in the process model (shown in Figure 5). 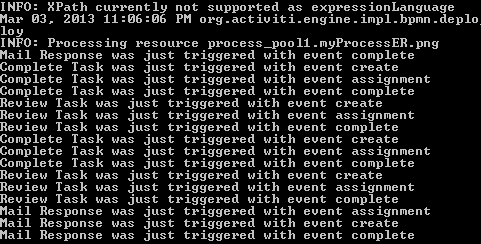 Which when run in the Activiti execution engine, does not enforce any of the constraints yet, though will print out the firing of events for each activity. [Hinge2009] K. Hinge, A. K. Ghose, and G. Koliadis, “Process seer: A tool for semantic effect annotation of business process models,” in 13th IEEE International EDOC Conference, 2009.